Reading and share top 46 famous quotes and sayings about Singularity by famous authors and people. Browse top 46 famous quotes and sayings about Singularity by most favorite authors. 1. "The death takes a moment and life lasts forever. 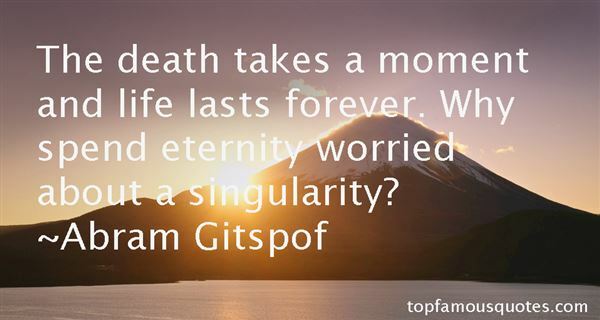 Why spend eternity worried about a singularity?" 2. "There are 1,198,500,000 people alive now in China. To get a feel for what that means, simply take yourself - in all your singularity, importance, complexity, and love - and multiply by 1,198,500,000. See? Nothing to it." 3. "All the events of his life were compressing to singularity: one night, one hour." 4. "It is natural but wrong to visualize the singularity as a kind of pregnant dot hanging in a dark, boundless void. But there is no space, no darkness. The singularity has no "around" around it. There is no space for it to occupy, no place for it to be. We can't even ask how long it has been there—whether it has just lately popped into being, like a good idea, or whether it has been there forever, quietly awaiting the right moment. Time doesn't exist. There is no past for it to emerge from." 5. "Life and Jah are one in the same. Jah is the gift of existence. I am in some way eternal, I will never be duplicated. The singularity of every man and woman is Jah's gift. What we struggle to make of it is our sole gift to Jah. The process of what that struggle becomes, in time, the Truth." 6. "To inspire a singularity of focus, a challenge must be important to you and it must be something you feel you should do now in this moment. If it's trivial or not time-bound, you won't engage. So in selecting your next challenge in life, choose one that is meaningful and will demand your complete concentration." 7. "Sometimes, there was no getting over it. Sometimes, you lived with the empty place inside of you until you imploded on it, loss as singularity, or until the empty place expanded and hollowed out the rest of you so thoroughly you became the walking dead, a ghost in your own life." 8. "Life begets intelligence, intelligence begets smart matter and a singularity." 9. "Is not happening yet," contributes Boris. "Singularity implies infinite rate of change achieved momentarily. Future not amenable thereafter to prediction by presingularity beings, right? So has not happened." 10. "Look, we know, now, that a singularity doesn't turn into a voracious predator that eats all the dumb matter in its path, triggering a phase change in the structure of space—at least, not unless they've done something very stupid to the structure of the false vacuum, somewhere outside our current light cone." 11. "Don't bury personal obsessions. Capitalize on them. ``The connection between personal obsession and the work you do is the most important thing.'' -- Be yourself. ``Singularity is what you need.'' -- Avoid self-censorship: ``We are very self-critical in a way that can be very destructive. In our culture there are voices in our head which have taught us to say, `Oh, I wouldn't do that if I were you.' Don't ever think about anybody peering over your shoulder.'' -- Don't be afraid to show off, even if you think, ``I'm very close to making a complete fool of myself.'' -- Don't be afraid to entertain. ``I want to entertain. I don't want to lose people. I feel responsible as I write to give people the best time I can.'' -- ``Love your failures'' instead of beating yourself up over them.-- ``Learn to love the process'' of writing.-- Just do it. Barker likes something director Stanley Kubrick said: ``If you want to make a film, pick up a camera." 12. "These days, tales of what Facebook did with its users during the singularity are commonly used to scare naughty children in Wales." 13. "Matter," Vittoria repeated. "Blossoming out of nothing. An incredible display of subatomic fireworks. A miniature universe springing to life. He proved not only that matter can be created from nothing, but that the Big Bang and Genesis can be explained simply by accepting the presence of an enormous source of energy. ""You mean God?" Kohler demanded. "God, Buddha, The Force, Yahweh, the singularity, the unicity point—call it whatever you like—the result is the same. Science and religion support the same truth—pure energy is the father of creation." 14. "Overall, it seems now possible to draw a reasonably good explanation of why the human condition is a singularity, why the likes of it has occurred only once and took so long in coming. The reason is simply the extreme improbability of the preadaptations necessary for it to occur at all. Each of the evolutionary steps has been a full-blown adaptation in its own right. Each has required a particular sequence of one or more preadaptations that occurred previously. Homo sapiens is the only species of large mammal – thus large enough to evolve a human-sized brain – to have made every one of the required lucky turns in the evolutionary maze. (45)"
15. "The children are taught more of the meanest state in Europe than of the country they are born and bred in, despite the singularity of its characteristics, the interest of its history, the rapidity of its advance, and the stupendous promise of its future." 16. "It is singularity which often makes the worst part of our suffering, as it always does of our conduct." 17. "Zombies are familiar characters in philosophical thought experiments. They are like people in every way except they have no internal experience.... If there are enough zombies recruited into our world, I worry about the potential for a self-fulfilling prophecy. Maybe if people pretend they are not conscious or do not have free will - or that the cloud of online people is a person; if they pretend there is nothing special about the perspective of the individual - then perhaps we have the power to make it so. We might be able to collectively achieve antimagic. Humans are free. We can commmit suicide for the benefit of a Singularity. We can engineer our genes to better support an imaginary hive mind. We can make culture and journalism into second-rate activities and spend centuries remixing the detritus of the 1960s and other eras from before individual creativity went out of fashion. Or we can believe in ourselves. By chance, it might turn out we are real." 18. "Anyone who knows a strange fact shares in its singularity." 19. "A celibate, like the fly in the heart of an apple, dwells in a perpetual sweetness, but sits alone, and is confined and dies in singularity." 20. "Poetry should surprise by a fine excess and not by singularity, it should strike the reader as a wording of his own highest thoughts, and appear almost a remembrance." 21. "Is it not the singularity of life that terrifies us? Is not the decisive difference between comedy and tragedy that tragedy denies us another chance? Shakespeare over and over demonstrates life's singularity — the irrevocability of our decisions, hasty and even mad though they be. How solemn and huge and deeply pathetic our life does loom in its once-and doneness, how inexorably linear, even though our rotating, revolving planet offers us the cycles of the day and of the year to suggest that existence is intrinsically cyclical, a playful spin, and that there will always be, tomorrow morning or the next, another chance." 22. "You're different. You're more perfect. Time is three things for most people, but for you, for us, just one. A singularity. One moment. This moment. Like you're the center of the clock, the axis on which the hands turn. Time moves about you but never moves you. 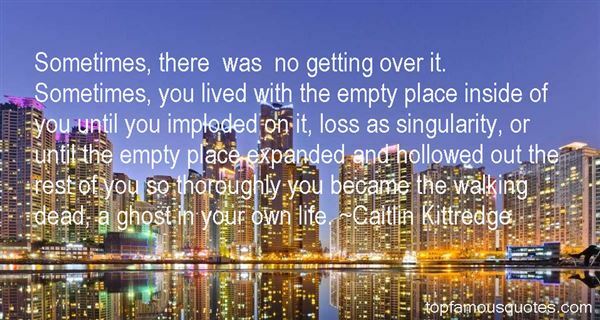 It has lost its ability to affect you. What is it they say? That time is theft? But not for you. Close your eyes and you can start all over again. Conjure up that necessary emotion, fresh as roses." 23. "What is the Conscious leap?Conscious leap is a term that refers to a process of change.It specifies a particular point in the process where a change cannot be undone or reversed.The leap is the singularity point ,the point of no return.It will be a fundamental change in everybody's way of living.Not everybody will remain alive during this turbulent phase.Thought of the Day"
24. "I'm no one... I don't want to be anyone. I stepped into singularity to exist within a void. I'm no one... However, I am becoming... Imagination. I am grabbing conception, and leaving humanity behind. Humans have lost their sight, and individuality makes people blind to the truth. It makes people believe that anything is possible. Only nothing is possible. But then again, my words are the words of no one." 25. "This singularity of meaning--I was my face, I was ugliness--though sometimes unbearable, also offered a possible point of escape. It became the launching pad from which to lift off, the one immediately recognizable place to point to when asked what was wrong with my life. Everything led to it, everything receded from it--my face as personal vanishing point." 26. "Clarence Hervey might have been more than a pleasant young man, if he had not been smitten with the desire of being thought superior in every thing, and of being the most admired person in all companies. He had been early flattered with the idea that he was a man of genius; and he imagined that, as such, he was entitled to be imprudent, wild, and eccentric. He affected singularity, in order to establish his claims to genius. He had considerable literary talents, by which he was distinguished at Oxford; but he was so dreadfully afraid of passing for a pedant, that when he came into the company of the idle and the ignorant, he pretended to disdain every species of knowledge. His chameleon character seemed to vary in different lights, and according to the different situations in which he happened to be placed. He could be all things to all men—and to all women." 27. "They say an infant can't see when it is as young as your sister was, but she opened her eyes, and she looked at me. She was such a little bit of a thing. But while I was holding her, she opened her eyes. I know she didn't really study my face. Memory can make a thing seem to have been much more than it was. But I know she did look right into my eyes. That is something. And I'm glad I knew it at the time, because now, in my present situation, not that I am about to leave this world, I realize there is nothing more astonishing than a human face...You feel your obligation to a child when you have seen it and held it. Any human face is a claim on you, because you can't help but understand the singularity of it, the courage and loneliness of it. But this is truest of the face of an infant. I consider that to be one kind of vision, as mystical as any." 28. "In [Bloom's] having managed to sustain his curiosity about the people and the world around him after thirty-eight years of familiarity and routine that ought to have dulled and dampened it; and above all in the abiding capacity for empathy, for moral imagination, that is the fruit of an observant curiosity like Bloom's, I found, as if codified, a personal definition of heroism.Ulysses struck me, most of all, as a book of life; every sentence, even those that laid bare the doubt, despair, shame, or vanity of its characters, seemed to have been calibrated to assert, in keeping with the project of the work as a whole, the singularity and worth of even the most humdrum and throwaway of human days." Michael Chabon"
29. "Perhaps [transgression] is like a flash of lightning in the night which, from the beginning of time, gives a dense and black intensity to the night it denies, which lights up the night from the inside, from top to bottom, yet owes to the dark the stark clarity of its manifestation, its harrowing and poised singularity." 30. "Seriously, that woman is so much crazy crammed into a small space that she's practically a crazy singularity." 31. "Cosmopolitanism promotes a sense of new _we-ness as regarding every individual human being as a citizen of the cosmos. However, the _we-cosmic-citizens_ are not to promote the _we-ness-in-sameness_, but rather the we-ness-in-alterity_.Unlike the solidarity-in-sameness, cosmopolitan _solidarity-in-alterity_ celebrates the singularity and difference of each individual human being while not denying the historical necessity of the strategic construction of _we_ to challenge the very sociopolitically imposed category"
32. "Do you realize that if you fall into a black hole, you will see the entire future of the Universe unfold in front of you in a matter of moments and you will emerge into another space-time created by the singularity of the black hole you just fell into?" 33. "My main interest is the problem of the singularity. If we can't understand what happened at the singularity we came out of, then we don't seem to have any understanding of the laws of particle physics. I'd be very happy just to understand the last singularity and leave the other ones to future generations." 34. "He is astonished at the fact of his being, and this astonishment leads to reflection: as he leans over the river of his consciousness, he asks himself if the face that appears there, disfigured by the water, is his own. The singularity of his being, which is pure sensation in children, becomes a problem and a question"
35. "Losing faith in your own singularity is the start of wisdom, I suppose; also the first announcement of death." 36. "One way of emphasizing the singularity of the recent past is [..] to observe that the total number of humans ever to have lived is estimated at around (a bit less than) 100 billion. One of Walt Whitman's poems has a memorable image—thinking of all past people lined up in orderly columns behind those living—‘row upon row rise the phantoms behind us'. Actually, looking over our shoulder, we would see only around 15 rows." 37. 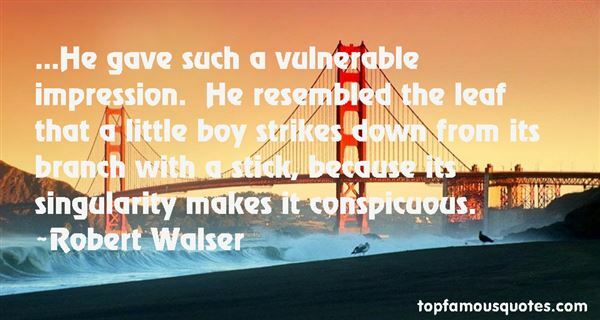 "...He gave such a vulnerable impression. He resembled the leaf that a little boy strikes down from its branch with a stick, because its singularity makes it conspicuous." 38. "The idea, therefore, that religious faith is somehow a sacred human convention—distinguished, as it is, both by the extravagance of its claims and by the paucity of its evidence—is really too great a monstrosity to be appreciated in all its glory. Religious faith represents so uncompromising a misuse of the power of our minds that it forms a kind of perverse, cultural singularity—a vanishing point beyond which rational discourse proves impossible." 39. "God abhors a naked singularity." 40. "I believe in singularity in relationships because you've got to have trust on both sides." 41. "The singularity of the point of suspension, the duality of the plane's dimensions, the triadic beginning of pi, the secret quadratic nature of the root, and the unnumbered perfection of the circle itself." 42. "Man's singularity is his divinity." 43. "How will the approach of the Singularity spread across the human world view?" 44. "But if the technological Singularity can happen, it will." 45. "I have argued above that we cannot prevent the Singularity, that its coming is an inevitable consequence of the humans' natural competitiveness and the possibilities inherent in technology." 46. "All this ferment was public, we might almost say tranquil.The imminent insurrection gathered its storm calmly in the face of the government. No singularity was lacking in this crisis, still subterranean, but already perceptible. The middle class talked quietly with workingmen about the preparations. They would say, "How is the uprising coming along?" in the same tone in which they would have said, " How's your wife?" Can we get out of here? ""Your chariot awaits. ""In the form of a blue Ford ute?" I curved my brow. "But of course," he said in an over-the-top French accent. "Sacre blur, bad accent alert! ""Wow," he said, "Le rude? ""Le sorry? ""Le hurt." Toby clutched his heart. "What can I do to soothe your shattered ego? "Toby drummed his chin thoughtfully, pacing around me. He stopped just near enough to whisper in my ear. "Le kiss?"